In 1945, the victorious Allied governments founded the United Nations and drafted the United Nations Charter as a constitution of the new international organization. 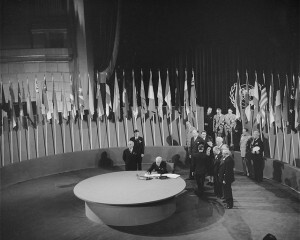 The Charter includes Articles 55 and 56 that describe in broad terms the duties and commitments of the member nations to promote human rights within their own countries and by working with the U.N.
By 1946, it was clear that nations, and their peoples, needed a more specific list of human rights and to encourage, let alone ensure, their enforcement. The U.N. General Assembly appointed Eleanor Roosevelt, widow of New Deal President Franklin D. Roosevelt, to establish a committee to draft a Universal Declaration of Human Rights. It should include broad rights and duties long listed in the U.S. Bill of Rights and in similar documents of several nations, and many rights and duties not spelled out in pre-20th century documents. The drafting was a long and difficult process because many ambassadors were determined to include language covering all of the types of violations in their nations. Others were quietly determined not to include rights that might offend the decision-makers in their nations. Eleanor Roosevelt is credited with keeping her colleagues up all night until they finally finished the drafting early in the morning of December 10, 1948. The document they drafted with such care and inclusiveness was the Universal Declaration of Human Rights. It was drafted as a Declaration, similar to the U.S. Declaration of Independence. It was NOT drafted as a treaty. The difference is that a Declaration is a statement of principles. It is not a law to be enforced in a court. A treaty, under the law of the U.S. and other nations, is binding law. 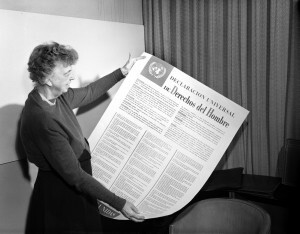 After years of complaints that the Declaration was not protecting human rights enough, although international law experts said it had become jus cogens, in 1966 the General Assembly listed the most basic concepts in the UDHR, and put half into the International Covenant on Civil and Political Rights (ICCPR) and half into the International Covenant on Economic, Social, and Cultural Rights (ICESCR). The Preamble of both treaties is the same, so ratification of ICCPR includes broad commitments to economic, social, and cultural rights and duties spelled out in ICESCR, and vice versa. In 1977, President Jimmy Carter signed the ICCPR and the ICESCR. In 1992, the U.S. Senated ratified ICCPR by ⅔ vote. The Senate has not yet ratifed the ICESCR. In 1965, the U.N. General Assembly promulgated the International Convention on the Elimination of all forms of Racial Discriminiation (ICERD). President Lyndon Johnson singed this treaty in 1966. The Senate ratified this treaty in 1994. In 1984, the U.N. General Assembly promulgated the International Convention Against Torture and other Cruel, Inhuman and Degrading Treatment or Punishment (ICAT), spelling out these rights and duties. President Ronald Reagan signed this treaty in 1988. The Senate ratified this treaty in 1994.